I just finished watching the Live streaming NYC SodaStream event where they announced their new brand ambassador! Isn’t technology great my friends?! I heard about the event yesterday where they would be announcing the new SodaStream brand ambassador, and they said it was someone exciting. Boy were they right! It’s Scarlett Johansson! You know. Scarlett Johansson from The Avengers and the upcoming Captain America: The Winter Soldier. Well done SodaStream. Well done. The Live Streaming event was not only fun to watch, but it was a breath of fresh air to listen to Ms. Johansson talk about SodaStream. Why? Well, she’s been a fan of the bubbling making soda machine for a long time. She purchased her first one at Williams-Sonoma years ago and was hooked. She’s been pushing it on her family and friends, as well as giving as housewarming gifts ever since. A brand ambassador that actually uses the product and was a fan for years prior? Love it. Ms. Johansson also mentioned that she likes SodaStream because you can tailor the drinks to your likes, for the fact that it replaces bottles & cans, how it has less calories than regular soda, and how it has no aspartame or high fructose corn syrup. She also said how easy the machine is to use. Like I said, it was a fun event to watch and very informative as well. Here are a few more photos from the event, including the atmosphere of the event. 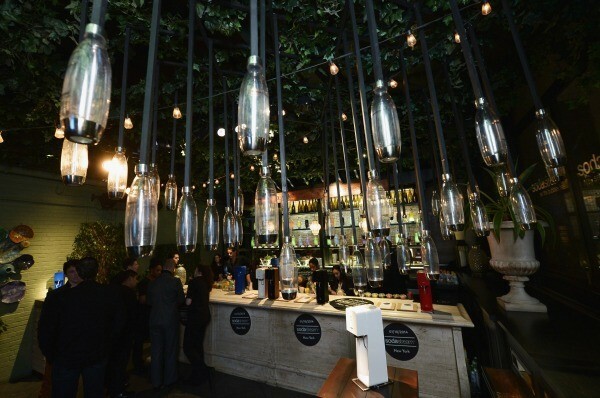 They had SodaStream bottles hanging from the ceiling. How clever! You can watch the live event yourself on the recorded replay video below. Enjoy! Ms. Johansson will also be showing up in a Super Bowl ad airing on FOX February 2nd. From what I’ve read and heard, this is a much anticipated ad, given last year’s ad sparked quite a bit of noise. You can read more about it here. This year’s ad will “focus on the benefits of SodaStream”, said Daniel Birnbaum, chief executive at SodaStream International, in an interview for The New York Times. Here’s a sneak peek at some shots from their upcoming Super Bowl ad. Here’s a look at their Super Bowl ad from last year. So, what do you think about SodaStream’s new Brand Ambassador?